Lake Superior was kind this year during the Madeira/Hesper Monitoring project weekend in July. The project group enjoyed fairly calm water and plenty of sunshine. Wheeling the "Preservation" Saturday morning to the wreck of the Madeira was Tim Pranke, joined by myself(project leader), my dad, Steve Daniel, Jim Christenson and his friend and archeologist Mandy Peterson. 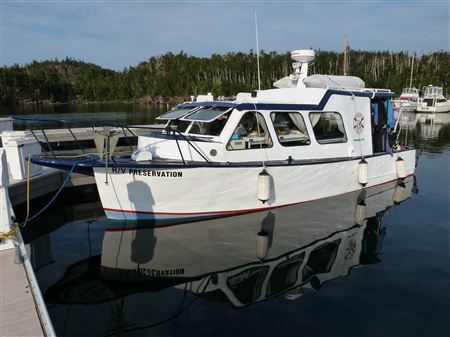 This was the first time Mandy has participated on a GLSPS project or cruised on the "Preservation". Tim brought an extra dry suit for Mandy, who's diving experience was mainly in warm water. She was ready to dive a shipwreck in Lake Superior. Unfortunately the suit did not seal up well for her, but not before she had the chance to see some of "Madeira". A short dive perhaps but I think Mandy will be back for more. We dove in pairs with Mandy helping on deck. Dad and I took some measurements from a stake I had installed last year to the pilot house and to the smoke stack. After comparing the measurements to last year's numbers it appears nothing has moved. We enjoyed viewing most of the wreck, from the stern to the pilot house then proceeding to the smoke stack and then over to the bath tub. Along the hillside to the stern swim thru and on to the bow and back again. There is a large piece of metal hanging in the stern swim thru towards the cliff that has dropped considerably since last year. It is more obvious and I feel less of a threat to divers. It appears more rivets are popping out of the hull plating on the stern section, starboard side. A possible preservation project could be replacing the missing rivets with bolts to slow the process of collapse. The stern is showing signs of shifting in different places. I think certain areas will have to be focused on and better documented each year to determine how much change is occurring. Once everyone got their fill of this amazing wreck for the day the "Preservation" headed back to Silver Bay, but not before taking a spin by Split Rock Lighthouse. After securing the dock lines and stowing gear the group headed into town to enjoy a good dinner and swap stories. Sunday came along and again the weather was decent. One long dive was enjoyed by everyone. Dad and I stuck to the wreck, starting with the rudder and swimming back and forth on opposing edges of the large pieces. I am always looking to catch site of something new. The "Hesper" really doesn't change much from year to year, but I always enjoy diving this wreck to checkout old ship building techniques. Tim and Jimmy ventured East of the wreck and spotted a couple of life boat davits and some other wreckage debris. The "Hesper" is intact and I believe it will remain that way for divers to enjoy for many more years. The weekend was wrapped up with lunch and a good dose of housekeeping for the "Pres". Thank you to everyone who participated on this project, bringing their individual skills, experience, knowledge and insight: Tim Pranke, Steve Daniel, Jim Christenson, and Mandy Peterson. I look forward to diving with you again.